A dual Group One winner as a two-year-old, US Navy Flag had taken in the English and Irish 2000 Guineas, finishing second in the latter, without gracing the winner’s enclosure this season. But reverted to sprinting, the Aidan O’Brien-trained colt showed his class on his first start against older horses. Ryan Moore had US Navy Flag in front from the start and the son of War Front kept up the gallop to land a convincing success, in the process giving the jockey his first July Cup win. Brando, who delayed the start as he had to be re-plated, went one place better than 12 months ago ins second, with Fleet Review third for the O’Brien team. O'Brien said: "He won a Middle Park very impressively last year, then we ran him in the Dewhurst and he was able to do that making the running, so we gave him the mile option this year. "He had tough races in the Classics and had a very tough race in the Curragh. We thought it might leave his mark. "He went to Ascot and Ryan said to come back in distance with him. We've seen what's happened. He's a very good horse, to be able to do it that as a three-year-old. "The plan with him was to come here and if it went well we would give him a rest and train him for the Everest in Australia. "In all fairness to the horse, he deserves a break. He's had a tough time." 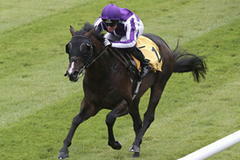 Moore said: "He loves Newmarket and ran a mighty race in the Irish Guineas. He's just a very fast horse and loves a fight - he found plenty when the second came to him. "I was never worried about the trip, he just needs to have fast ground." Kevin Ryan was proud of Brando's effort in defeat. He said: "We knew we had him in great shape and we avoided Ascot, not that we didn't want to go, we just felt he was so good at Newmarket we trained him for this race and it nearly came off. "It is a little bit gut wrenching it hasn't, but I'm proud of him. "He will go to the Maurice de Gheest now." Fourth home was the David Elsworth-trained Sir Dancealot. Elsworth said: "He ran well. He is in the same street as them, he just came up a bit short today. He needs a good gallop. It was a bit tough, the opposition, but he ran well. "There is the race at Goodwood, the Lennox, but he is not bad over six and you can play around. You have a flirtation with these sort of races, but you can always drop him down a cog and win with him. "Maybe he is just short of the best, but he is not bad."